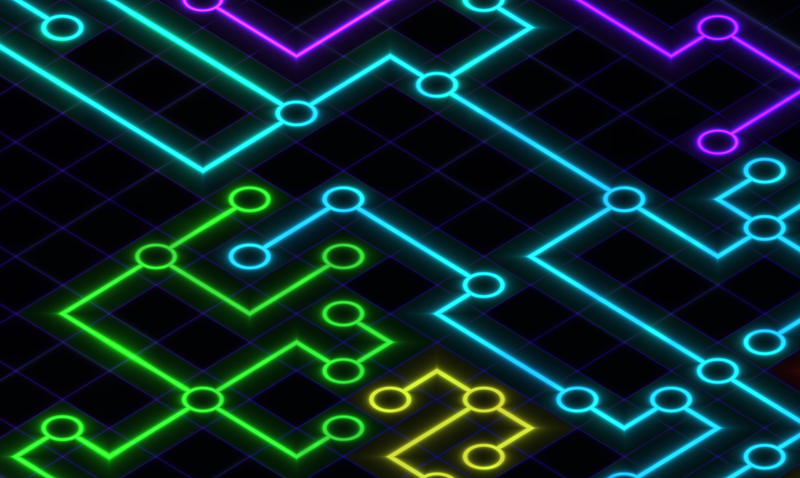 Now that I have all these ways to make simple lines colorful and glowy, I think I should focus on using them to make information clear and understandable. Maybe that can be the unique look of my game, creating a colorful environment out of the information you need, shifting the colors and shapes as you switch between abilities to show you the information you need for that ability. Here's a simpler effect to mark an area, so different visual effects won't conflict so much. 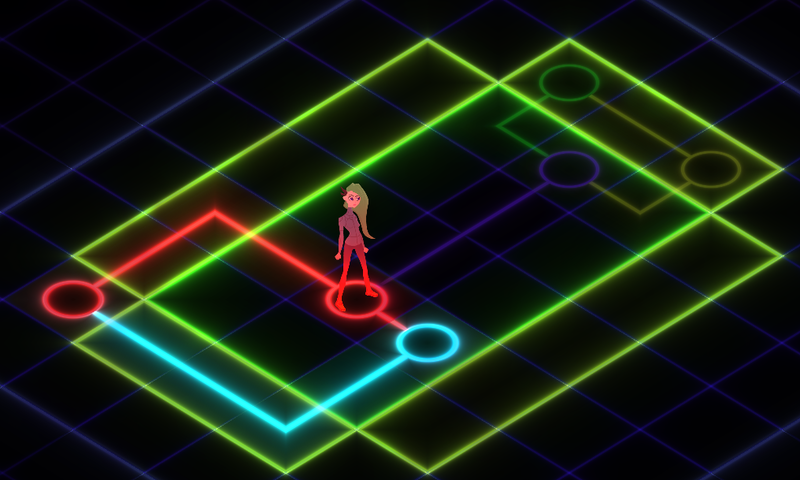 The way I'm making the area outline is by marking each side and corner that should glow for each tile. It gets a bit tricky, so in my previous screenshot I placed the sides and corners manually. Since then, I made the game figure out all the sides and corners on it's own. I did it in a way that should work for multiple area types at a time, because I may want to show a vision range, or enemy attack range at the same time as movement range. The trick now will just be making all these different lines and areas look good together, maybe by emphasizing different areas when they're needed more, with some subtle effects when they're not. I added a line to show the path you're moving. With all the different lines, it can become a bit overwhelming, so I tweaked the values to try and make things more readable. The main thing is turning off the overloaded colors, so the lines don't glow so harshly all the time. 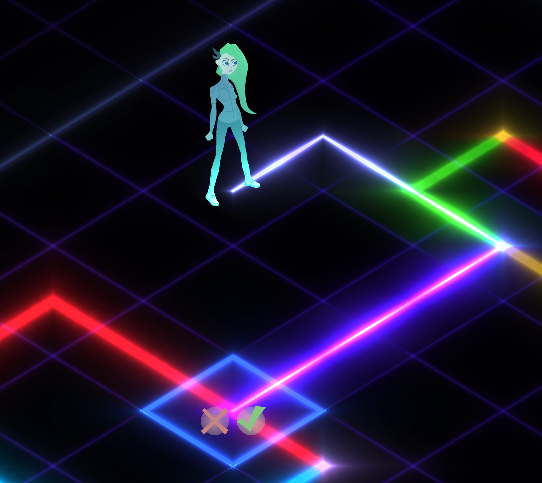 I added it back to the path line though, so you can see it shining through the resource lines. or, instead of dashes, using triangles, or something of that nature? Thanks. It's tricky picturing how all of these effects will fit together, and what will be the most readable and visually appealing. 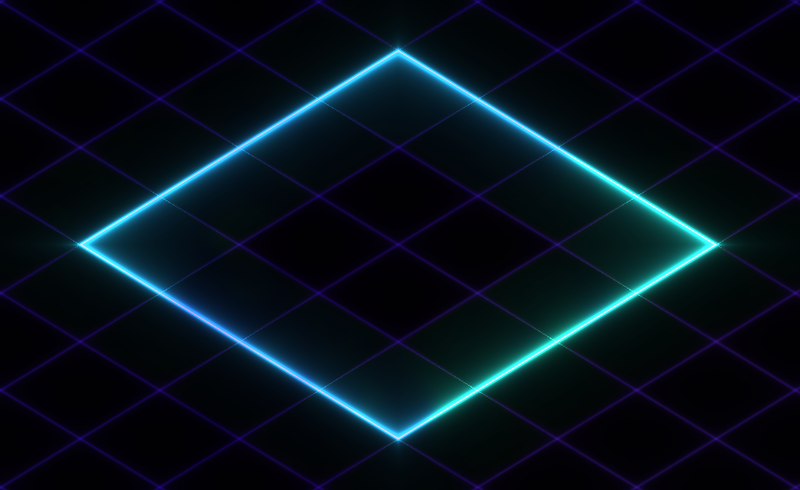 I could see something like a dotted line or CRT effect being useful for that. I'll have to keep trying out different effects as I go to see what works best. Here's a start with the Nodes. I think I may be consistent with their placement, putting them at the end of any resource line, and where two resource colors meet. Visually, I may want to adjust how I do the resource lines a bit so I can make them dark on the inside of the Node circle, like they connect with the node instead of continuing into the center of the circle. 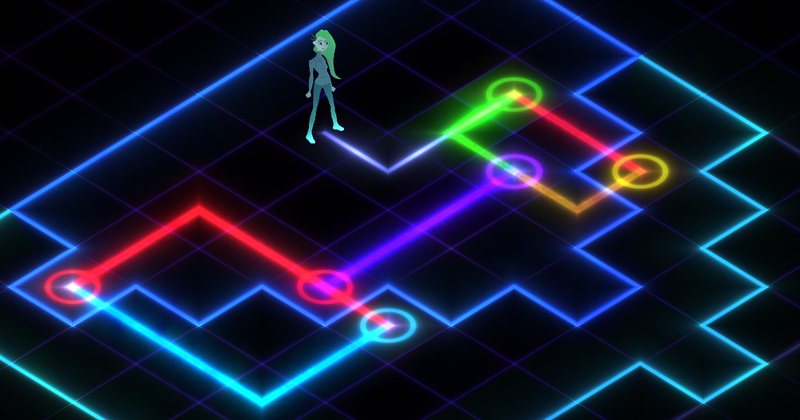 The gameplay plan for Nodes is that you'll have to stand on a node and use a hacking action to get access to resource lines and to other nearby nodes. You'll also get some kind of bonus to your stats or additional abilities while on a node. 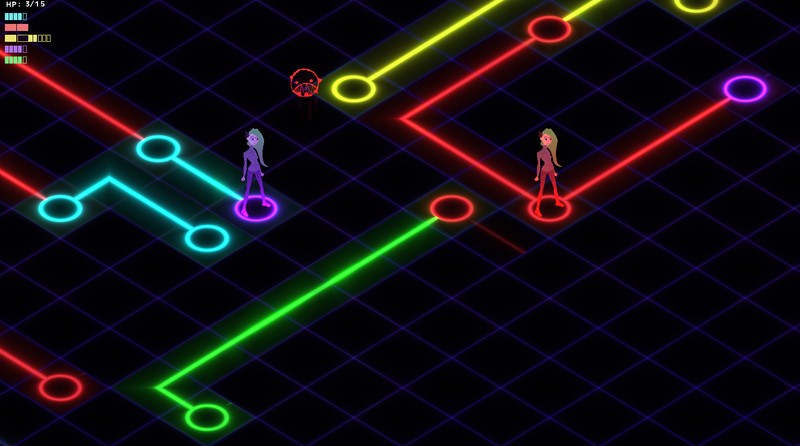 The goal will often include hacking specific Nodes, so you'll have to go from one to another to unlock the final Node, fending off enemies on the way. Before, I had a shader making the resource lines in a way that each pixel calculated it's distance from each line. I don't think this would scale very well, but did allow the resource lines glow to extend as far as I wanted without any edges. Today I made it so resource lines would be drawn just in the tiles that contain them, which helped me keep them dark inside the Nodes, and should be easier when I make bigger maps with areas that aren't currently visible. At the moment however, this makes some odd edges, where you can clearly see the glow stopping at the edge of the tile. But maybe this detail is ok and wouldn't bother anyone but me? 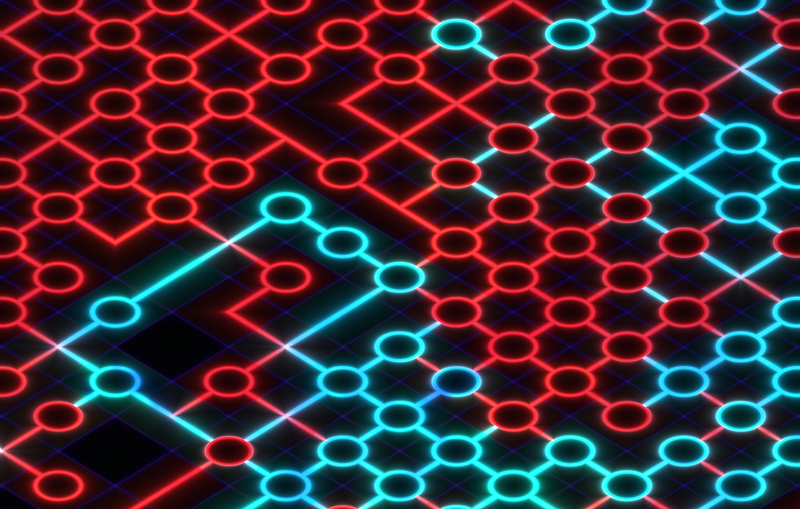 I like the overall look of the lines connecting with the node, and then leaving the node dark in the center, but I might need to come at this again later to figure out how to smooth those edges or extend the tiles. Also, switching to shading individual tiles is losing some of the texturing at the moment. I might just get rid of the rough texture, and increase the pulsing glow texture instead. I'm working on the gameplay, getting the combat and hacking set up. I want to get a better feel for how things play before getting in deeper to the UI. 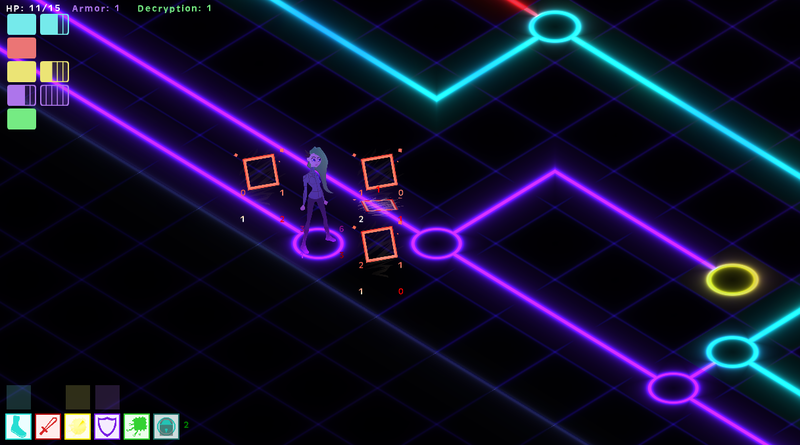 Right now, the basic hacking function works by standing on a node and using the hack ability. This creates a hacked area that you can increase in directions of your choice using hack points. Any nodes in the hacked area will be activated (allowing you to hack them if you go there). 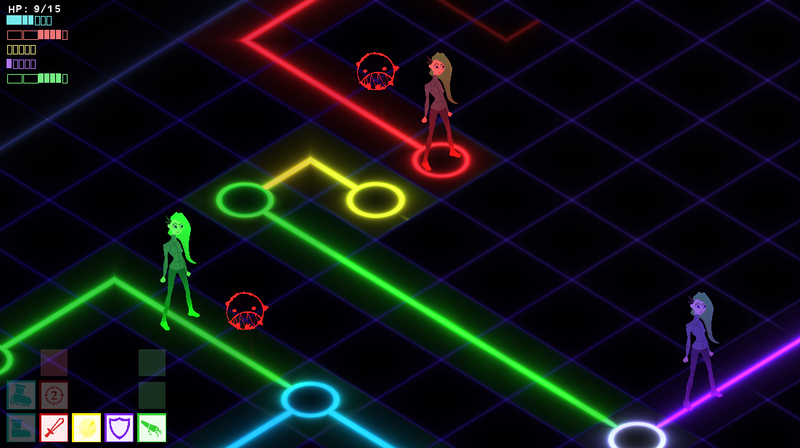 Any resource lines between those nodes will also be activated, allowing you to boost your stats by walking on them. 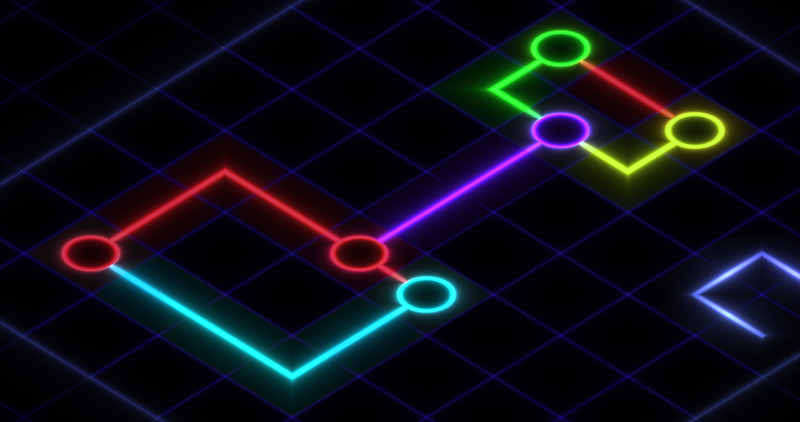 Today I added procedurally/randomly generated resource lines and nodes. They're more random now than I'll want in the end, but I'm pretty happy with it so far. This early version had some unexpected results. This week I've been making more abilities, and I'm adding abilities to nodes. So when you move on a node, your character gets access to that nodes ability. There's also an ability that lets you make a copy of a Node's ability for yourself, so you can use that ability again later when you're not on a node. I'm trying out an idea for the resources where you get a number of points to get 1 power that you can spend on special abilities. Functionally, this could work the same as having spells that cost multiples of 5 or whatever number, but there's something I like about clearly separating the power for your abilities. It's the idea of discrete choices, that you have a few red abilities to choose from, and the red power that you have can only be spent on one of them. 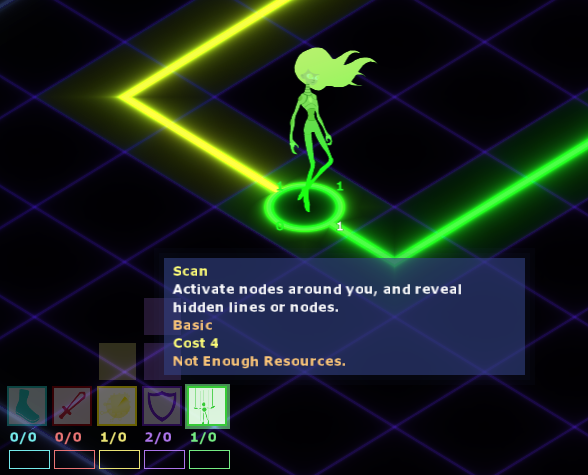 This week I updated the way you pick up abilities from Nodes. You can use an ability directly from a node, but to take it with you, you'll need to be skilled in that color to have the ability spaces. I also added an exit, and it feels pretty fun finding abilities to fight enemies while searching for the exit. I'm making more enemies this week and next week. I've been thinking about enemies serving different roles, both in what they do to stop you, and what you'll do to fight the enemy. One is weak on it's own, but fights in crowds. If they surround you, they can prevent you from moving and do a lot of damage, but you can hold them off with some good armor, or take them out with some area effect damage. An enemy I think I'll add next week has a lot of armor and health, and does a lot of damage, but has slow movement. You can beat it by hitting it with high damage attacks to break through it's armor, or simply run away from it with your superior speed. This week I've been trying out some new ideas with the gameplay. Before I had it where each character had 2 actions per turn, which was good when you moved to a node that allowed you to use a powerful ability on the same turn. But if you use your first action to scan and you find a good node in range, you can use your second action to move there but don't have a third to make use of that ability yet. So now I'm trying a system where you can continue using abilities if you have the resources for them. Your first standard ability is a free one, so you could move for free, then do more once you have the resources for it. This allows you to have big turns with interesting combos. I was trying out abilities that played with accuracy and critical hits, but that kind of combat system feels a bit too separate from the interesting movement and positioning that's making the game fun. Instead, I'm going to try some new ideas with directional armor and directional attacks, so your attacks and defense play with the movement like other systems. I can also simplify the movement of enemies. By limiting the enemy attack possibilities, you can predict where they'll hit so you don't leave your vulnerable side exposed. I've been trying out the directional armor. It's a bit hard to read what's going on, at the moment, but I think this will be a good area to expand the players combat options. 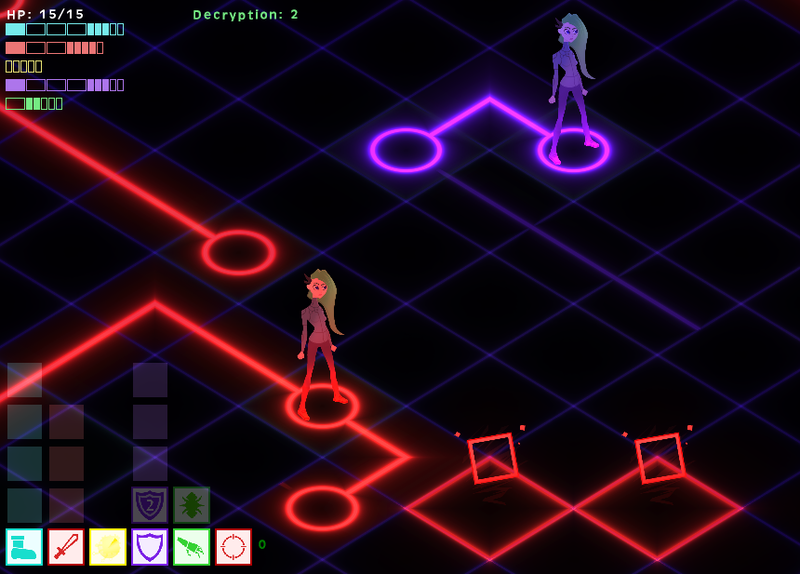 Attack types could vary by the areas they attack and sometimes by the directions they hit, so the attacks and defenses play with movement just like the resources and nodes do. Early in my brainstorming of this game I thought about ability crafting. Being able to make your own abilities, or at least modify them to be stronger in different ways, so you can design your own way through the enemy systems. I also thought the abilities you use and that enemies use could be linked, so you could take abilities from enemies. Unfortunately, I felt like the ideas I had with that were complicating the design, without really adding much. Last week, I finished reading Spelunky, and I was thinking about the way Derek Yu made sure everything in Spelunky followed consistent rules, allowing for surprising combinations of events. Like an enemy that loses his weapon, then finds a weapon in a store and takes it triggering the shop keeper to start shooting his shotgun, because that's what they do when the player steals from a shop keeper. If an enemy can use a weapon, you may have a way to get that same weapon and use it too. So after you've played the game for a while, you get a feeling for how everything works, and everything you encounter adds to that knowledge and fits in with it. So I started thinking about crafting abilities again, so you can mix targeting types with different effects, and get those ability pieces from enemies to recreate any ability the enemies use. This could also allow you to modify enemies abilities. Although this would add some complexity to the game, I think I can make it work in a meaningful way, so you get a feeling how everything works and add to your knowledge of how the systems fit together as you go. I haven't added it to the game just yet, but I like where the ideas are going. Being able to steal an enemy's ability is cool because you get excited about meeting new enemies on top of all the other reasons. Being able to steal their abilities means that each time you fight something new you can be like 'oh man, what he does is cool, I want to do that'. I'm not sure if it'll work out in your game, but in Castlevania DS, most of the enemies had abilities you'd get after you killed them enough times for the RNG to spit it out. It meant that a grind wasn't terrible because you stand to gain from it in interesting ways. Anyway that Weiss article is heartbreaking. Putting 4 years into a game and having it flop is the worst. Looks like I haven't posted anything in a while. For some of that time, I tried out different designs, unsure if I should use action points, a limited number of actions, or as many actions as you can do if you have the resources to do them. I think at this point it would help to get the game in front of someone else, to get a better idea of what works and what doesn't. But the game wasn't really user friendly, so this week I worked on some of the UI elements, like adding descriptions to abilities when you mouse over them, also displaying their cost, and the reasons the ability might be unavailable (like if it's in cooldown or if you don't have enough resources to use it). 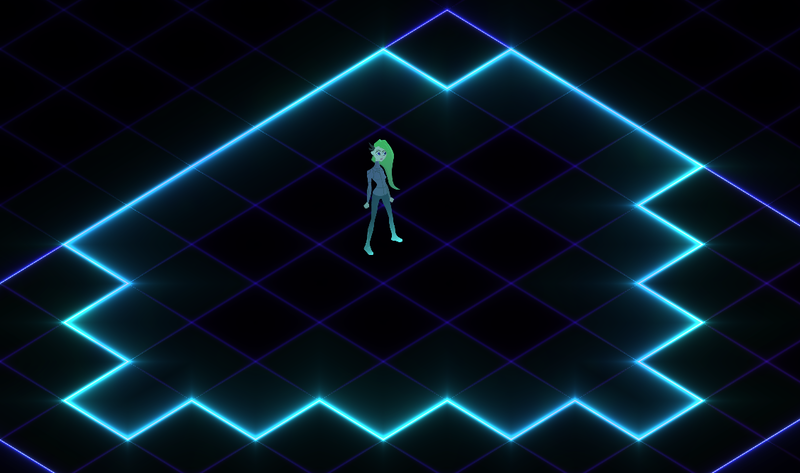 I also looked at some other turn based games, and I really liked how Invisible inc puts most of their abilities out in the play area, instead of off in some corner. If you click next to a door to move there, the button to peek through that door is right next to it, right where your mouse is. The description of how peek works appears instantly when it's moused-over. Before I put Radiant Verge in front of someone else, I want to get some of this ease of use in place, so I can step back and see the game played without butting in. This week I finished a Game Design Document for Radiant Verge. Although I'm making the game on my own, it's a turn based game with several systems interacting with each other, so I think having everything organized in one place will make a big difference. I had ideas for the game scattered through multiple sketch books, and planned to be more agile with the development, following the fun and all that. Now, I have a much clearer vision of the game, and of the feeling I want players to have when they look at which abilities they can use each turn. If any piece of the design doesn't work quite like I expected, I can fit any changes into the design with the whole game and that feeling in mind. I'm also drawing more. I plan to do a lot more visuals in the coming months, and want to up my game with character design and animation. I hope to have more to show off soon. Oh, and here's a title design I've been working on.